For most of the past couple of years, Connecticut Gov. Dan Malloy has talked a good game about undertaking systemic reform — and for the most part, he’s walked it too. From appointing reform advocate Stefan Pryor as his education superintendent, to succinctly summing up the problems with tenure and other aspects of traditional teacher compensation, to facing down American Federation of Teachers and National Education Association officials during town hall meetings, Malloy has made Connecticut one of Dropout Nation‘s Five States to Watch on the school reform front. And this year, Malloy has done plenty to sell state Senate Bill 24, which would end near-lifetime employment, require the use of student test performance data in evaluating teachers, allowing the results of evaluations to be used in awarding tenure and dismissing laggard teachers, and provide charter school operators with funding equivalent to traditional district counterparts. But now, the co-chairs of Connecticut’s joint education committee –after meeting behind closed doors with NEA and AFT bosses (who likely reminded them that they face re-election this year and may need union coffers) have essentially eviscerated Malloy’s plan. Allowing new evaluations to be used in tenure decisions will be “studied” (another term for “no snowball’s chance in hell will happen”), while charters ate unlikely to see any additional funds this year. Another Malloy proposal — a state takeover of the worst failure mills through the creation of a special district modeled off of the successful Recovery School District in New Orleans — wouldn’t happen until the 2013-3014 school year. Meanwhile the use of student test data in evaluations would only be required for those teachers who are seeking a master instructor status. Put bluntly, legislative leaders have all but decided to do keep the status quo quite ante and do nothing to address one of the nation’s most-persistent racial-, ethnic-, socioeconomic-, and gender-based achievement gaps. If anything, the proposed re-write would actually be worse than doing nothing. In some sense, this isn’t shocking. Forget the reality that NEA and AFT affiliates still wield tremendous clout — and made it clear in a series of commercials launched just before the session began. Malloy hasn’t had the best relationship with legislators. Last I checked, committee chairmen and house speakers, as concerned about their egos and ambitions as they are about their political futures, aren’t willing to do much more than necessary for a governor with whom they don’t get along. More importantly, Malloy hasn’t worked as closely with some reformers on the ground, largely out of fear of inciting NEA and AFT ire. But what Malloy failed to realize was that the two unions were going to oppose his efforts anyway. What should Malloy do now? Based on the comments of his P.R. staff, the governor may think it is best to just go along with the deal, or perhaps, even try to reverse some of the language. Certainly such thoughts are understandable. After all, politics is as much about the art of the possible as it is about taking leadership, and no governor wants to end a legislative session without some sort of victory, no matter how Pyrrhic. Yet the deal that will likely land on the table in the next six weeks will likely be as bad or worse than what education committee leaders have come up. Considering the AFT’s own penchant for backroom dealing, pushing to exclude school reformers and Parent Power groups from negotiations, and trying to use “kill mode” tactics to stop reforms, there’s no way that Malloy can believe that the legislature will do the right thing. This is the kind of moment that separates true leaders in the school reform movement from those who are just talking the proverbial smack. And it is time for Malloy to take this moment to heart and prove that he won’t just accept mere bones on behalf of Connecticut’s children. The first step he should take starts this morning by formally declaring in a press conference or at an event that the legislature’s deal is absolutely unacceptable. More importantly, he will say that he will not sign that deal under any circumstances unless most of S.B. 24’s original language is put back in. Certainly this will anger legislative leaders. But at the same time, it makes clear that compromise just for the sake of compromise is no longer acceptable when it comes to Connecticut public education. The second step lies with going to the airwaves in a televised address once again making the case for why reform is needed. This means using stark language making clear that this is a question of morality and of the future. If Connecticut citizens truly care for all children (especially their own) — and if they want the state to continue to thrive into the future — they must pressure their legislators to do what’s right. He should then blast the phone numbers of every legislator on television so that they can be called up. After all, legislators are more scared of phone calls and e-mails from impassioned constituents than they are fearful of challenging teachers’ union influence. Malloy should then team up with reformers on the ground — from the Connecticut Parents Union to ConnCAN — as well as rally community leaders (especially black clergy) around reform. This includes actually declaring that Zip Code Education should come to an end by demanding that legislators also include language that no longer makes it a crime for parents such as Tanya McDowell and Marie Menard to help their kids escape from failure mills that endangers the future of their children. Last week, the state legislature’s judiciary committee considered House Bill 5508, which would reduce the laughable charge of stealing education from a felony to a misdemeanor; Malloy should weigh in on this bill. (Connecticut Parents Union President Gwen Samuel testified on the bill.) Arguing against Zip Code Education puts a human face on why reform is needed. In addition, Malloy should get his network of political funders to finance a series of commercials that also put a human face on the need for reform. Malloy should also work with the Republican minority leadership in both houses in order to force matters; such a bipartisan approach would also remind the Democrat majority that they can no longer accept the status quo in education. What if none of this works? Malloy should just veto S.B. 24. Period. It’s not worth signing. Malloy should then work with reformers on running candidates to primary the legislature’s education committee co-chairs. Some would call it hardball. It is. But political leaders don’t deserve allegiance if they don’t do the right thing by their constituents. Right now, Malloy has an opportunity to win the long-term war for reforming public education in the Nutmeg State. It is time to take advantage of it. 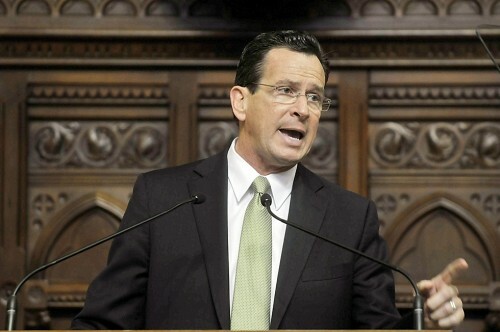 Pingback: Dan Malloy and The National Forces Pushing for Education Reform - Wait, What? Malloy is done in this state. He can kiss his national aspirations goodbye too. Connecticut’s middle class residents are on to the “DEFORM MOVEMENT” and the corportization of public education. We won’t forget about his corruption come November and we will vote out Mr. Malloy and his ilk if not impeach him for corruption charges sooner. Get out of our state carpet bagger. You’re not needed! If you want the truth read the posting below and Jon’s research. Here in CT we do not believe a few billionaires and milliinaires are suddenly concerned with the poor children in the cities. This nothing more than a bunch of philanthrocapitalists looking to make money by privatizing schools and establishing a less educated cheaper workforce. We can read the bill for ourselves. We don’t need out of state faux educator telling us what’s best for our local schools. Malloy is just their puppet. I don’t think he has even read the bill. The question is who wrote the bill for him? Malloy will never get re-elected. He needs to start planning his second career in D.C. and become 1/2 a governor just like Palin. Let the millionaire make a real difference by mentoring a city child, funding an afternoon homework club, providing job training to city youth. We wouldn’t want him to have to look a real poor kid in the eyes. Nah…better to write checks to lobbyists who pretend to care about children while earning six figure salaries while bloviating about education. Pelto’s research exposed the Adamowski special fund…the longer this drags on the more time there is to expose the faux educators for who they really are…vultures. If you want the kids to do well in school, fix their home lives… Don’t blame the teachers. You get out of school what you put into it. How about holding some kids accountable for a change… it’s always someone elses fault.. that’s the real problem. I also wouldn’t suggest privatizing unless you want to pay as much money for high school as you do college….4 years is like buying a big expensive house… ridiculous. Malloy and company are transparent morons… they could give two hoots about those kids and anyone with a brain knows it.